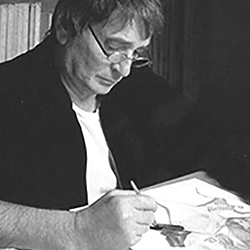 Itzchak Tarkay is considered to be a key figure in the modern figurative movement. Artworks by the Israeli artist are instantly recognizable—perceptive studies on people and places in a timeless world, captured in image by female socialites, parlors, terraces, and quiet cafés. His art has been featured in more than 50 exhibitions around the world. Tarkay passed away in 2012, leaving behind a legacy that not only represents a great artist, but a great man.